Water polo is a team water sport that combines elements of swimming and handball. A team consists of six field players and one goalkeeper. The objective of the game is to score as many goals as possible, with each goal being worth one point. Water polo, whose history is somewhat enigmatic, has progressed into a major sport and is played by both men and women. Note: Rules below reflect the latest FINA Water Polo Rules 2005-2009. Seven players from each team (six field players and a goalkeeper) are allowed in the playing area of the pool during game play. Players from the visiting team wear numbered white caps, while the hosts sport their dark caps. Both goalies wear quartered red caps, numbered "1." Both teams may substitute players. During game play, players enter and exit in front of their team bench; when play is stopped, they may enter or exit anywhere. Swimming: Water polo is a sport that requires the ability to swim effectively. 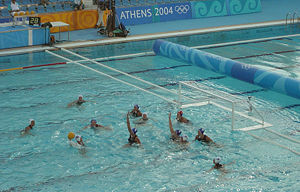 Field players must swim from end to end of a 30-meter pool non-stop many times during a game. The front crawl stroke used in water polo differs from the usual swimming style in that the water polo players swim with their head out of water at all times to observe the field. The Backstroke is used when defending field players to track advancing attackers and by the goalkeeper to track the ball after passing. In water polo, the backstroke differs from that in swimming; the player sits almost upright in the water, using eggbeater leg motions with short arm strokes to the side instead of long straight-arm strokes. This allows the player to see the play and quickly switch positions. Goalie eggbeatering up to block a shot. Ball handling: Field players are only allowed to touch the ball with one hand at a time so they must develop the ability to catch and throw the ball with either hand and also the ability to catch a ball from any direction. Experienced water polo players can catch and release a pass or shoot with a single motion. The size of the ball can overwhelm a small child's hand making the sport more suitable for older children. Treading water: The most common form of water treading is generally referred to as the "egg-beater", named because the circular movement of the legs resembles the motion of an egg-beater. Egg-beater is used for most of the match as the players cannot touch the bottom of the pool. The advantage of this maneuver is that it allows the player to maintain a constant position to the water level, and uses less energy than other forms of treading water such as the scissor kick, which result in the player bobbing up and down. It can be used vertically or horizontally. The horizontal egg-beater is used to resist the forward motion of an attacking player. Vertical eggbeater is used to maintain a position higher than the opponent. By kicking faster for a brief period the player can get high out of the water (as high as their suit—below their waistline) for a block, pass, or shoot. Eggbeater is also used in a water polo stroke style called spider where an attacking or defending player can legally ward off opposing players with quick, sharp strokes of the arms thus creating an area that the opposing players cannot enter. The game clock is stopped when the ball is not 'in play'. One such example is between a foul is committed and the free throw is taken; another is the time between the scoring of a goal and the restart. This causes the average quarter to last around 12 minutes 'real time'. A team may not have possession of the ball for longer than 30 seconds without shooting for the goal or an opponent being ejected. After this time, possession passes to the other team. However, if a team shoots the ball within the allotted 30 seconds, and regains control of the ball, the shot clock is reset to 30 seconds. Each team may call two one-minute timeouts in the four periods of regulation play, and one timeout if the game goes into overtime. During game play, only the team in possession of the ball may call a timeout. Dimensions of the water polo pool are not fixed and can vary between 20 x 10 and 30 x 20 meters. Minimum water depth must be least 1.8 meters (6 feet), but this is often waived for age group or high school games if such a facility is unavailable. The goals are 3 meters wide and 90 centimeters high. Water polo balls are generally yellow and of varying size and weight for juniors, women and men. The middle of the pool is designated by a white line. In the past, the pool was divided by 7- and 4-meter lines (distance out from the goal line). This has been merged into one 5-meter line since the 2005-2006 season. Along the side of the pool, the center area between the 5-meter lines is marked by a green line. The "five meters" line is where penalties are shot and it is designated by a yellow line. The "two meters" line is designated with a red line and no player of the attacking team can be inside this line without the ball. One player on each team is designated as the goalkeeper, assigned to deflect or catch any shots at the goal. The goalkeeper is the only player who can touch the ball with both hands at any time, and, in a shallow pool, the only player allowed to stand on the bottom. Players can move the ball by throwing it to a teammate or swimming while pushing the ball in front of them. Players are not permitted to push the ball underwater when being tackled, or push or hold an opposing player unless that player is holding the ball. Fouls are very common, and result in a free throw during which the player cannot shoot at the goal unless beyond the "5-meter" line. If a foul is called outside the 5-meter line, the player is either able to shoot or pass the ball. Water polo players need remarkable stamina due to the considerable amount of holding and pushing that occurs during the game, some allowed, some unseen or ignored by the referees (usually underwater). Water polo is one of the most physically demanding of all sports; action is continuous, and players commonly swim 3 kilometers or more during four periods of play. Water polo is a game requiring excellent hand-eye coordination. The ability to handle and pass the ball flawlessly separates the good teams from the great teams. A pass thrown to a field position player is preferably a "dry pass" (meaning the ball does not touch the water) and allows for optimal speed when passing from player to player with fluid motion between catching and throwing. A "wet pass" is a deliberate pass into the water, just out of reach of the offensive player nearest the goal (the "hole set") and his defender. The hole-set can then lunge towards the ball and out of the water to make a shot or pass. A goal may be scored by any part of the body except a clenched fist, or a foot. Scoring in water polo can be quite unique compared to other sports. For example, a "skip" or "bounce" shot is fired intentionally at the water with considerable force so it will bounce back up. The ball usually hits the water within a meter of the net, where the goalie cannot anticipate and block the shot. Another shot, called a "lob" is thrown with a large vertical arc. Often these shots are more difficult to stop than a faster shot, as they are usually thrown across a net at such an angle the goalie must not only shift position from one side of the net to the other quickly, but also at the same time propel out of the water more than for other shots. Pump faking is effective when using any kind of shot. The player gets in the position to shoot but stops halfway through his motion, causing the defending goalkeeper to commit too early to block the subsequent shot. The referee's whistle for a foul is heard much more in water polo than in other sports. A defender will often foul the player with the ball as a tactic to disrupt the opponent's ball movement. Play continues uninterrupted in most cases, but the attacker must now pass the ball instead of advancing or taking a shot. (An exception allows players to quickly pick up the ball and shoot if fouled outside of the five meter mark.) However, as in ice hockey, a player caught committing a major foul, is sent out of the playing area with his team a man-down for 20 seconds, but may return sooner if a goal is scored or his team regains possession. If the foul is judged to be brutal, the player is ejected for the remainder of the game, with substitution by another teammate after four minutes have elapsed. A player, coach or spectator can also be ejected for arguing with the referees. During a man up situation resulting from an ejection foul, the attacking team can expect to score by passing around to move the goalkeeper out of position. A player that has been ejected three times must sit out the whole match with substitution. There are six field player positions and a goalkeeper on each team. Unlike most common team sports, there is not any positional play; field players often will fill several positions throughout the game as situations demand. In high school most teams assign positions to certain players and it is less likely for the situations to switch due to the lower level of competitiveness. Players who are skilled at several offensive or defensive roles are called utility players. Utility players tend to come off of the bench, though this isn't absolute. An example is Thalia Munro, who played for UCLA and the USA National Team, among the team leaders in goals, steals and assists. Certain body types are more suited for particular positions, and left-handed players are especially coveted, allowing teams to launch two-sided attacks. The offensive positions include: one center (a.k.a. hole set, 2-meter offense, pit player or pit-man), two wings, two drivers (also called "flats"), and one "point" man. The point man directs the attack, and on defense is known as hole check, hole D, pit defense or 2-meter defense, defending the opposing team's center forward. The wings, drivers and point are often called the perimeter players. The most basic positional set up is known as a 3-3, due to the fact that there are two lines both containing three players. Another set up, used more by professional teams, is known as an "arc," umbrella, or mushroom, because the perimeter players form the shape of an arc, umbrella or mushroom around the goal with the center forward as the handle or stalk. The center forward, known by players as hole set or 2-meter is the center player in the middle of the umbrella who is closest to the opposing teams goal. This player sets up in front of the opposing team's goalie and usually scores the most individually (especially during lower level play where arc or perimeter players do not have the required leg strength to drop effectively onto the pit player) or contributes most often to initiating plays. The five perimeter players often swim the most and interchange their positions several times during a single offensive play. They contribute to the actual execution of plays, and cumulatively score the most points for the team. The point player's position provides opportunities to pass to teammates and communicate among the offense, like the point guard in basketball. The center forward also plays a big role offensively because they sit closest to the goal and usually attempt to shoot from close-range as frequently as possible with "Step-out"(a.k.a Roll-out), "Sweep," or "Backhand" shots. Defensive positions are often the same, but just switched from offense to defense. Defense can be played man-to-man or zone. The opposing center forward (hole set) is often double-teamed because of his position closest to the goal. From the center forward position, a backhand shot is difficult to defend because these shots are explosive and directed into the corners of the goal. In zone defense, players defend an area of the pool. A strong shooter or good passer can be double-teamed by the defense, known as "sloughing." The goalkeeper is generally one of the more anaerobically challenging positions. A goalie has to be able to jump out of the water, using little more than one's core and legs, and hold the vertical position without sinking into the water, all while tracking and anticipating a shot. The goal is 30 square feet in face area; the goalie should also be a master of fast, effective lateral movement in the water as well as lightening fast lunges out of the water to deflect a shot. Another key job that the goalkeeper is responsible for is guiding and informing his or her defense of imposing threats and gaps in the defense, and making helpful observations to identify a gap in the defense that the defenders may or cannot see. The ability to touch the ball with two hands. The ability to strike the ball with a clenched fist. The goalkeeper also has one limitation that other players do not have: he or she cannot cross the half-distance line. Also, if a goalie pushes the ball under water, it is not a turnover like with field players. It is a penalty shot, also called a 5-meter shot, or simply, a "5-meter." At the start of each period, teams line up on their own goal line. Three players go both sides of the goal; the goalkeeper starts in the goal. At the referee's whistle, both teams swim to midpoint of the field (known as the sprint or the swim-off); the referee drops the ball near the side of the pool. The first team to recover the ball becomes the attacker until a goal is scored or the defenders recover the ball. After a goal is scored, the teams line up anywhere within their halves of play, but usually along the midpoint of the pool. Play resumes when the team not scoring the goal puts the ball in play by passing it to a teammate. When the offense takes possession of the ball, the strategy is to advance the ball down the field of play and to score a goal. Players can move the ball by throwing it to a teammate or swimming while pushing the ball in front of them ("dribbling"). If an attacker uses his arm to push away a defending player and free up space for a pass or shot, the referee will rule a turnover and the defense will take possession of the ball. If an attacker advances inside the 2-meter line without the ball or before the ball is inside the 2-meter area, he is ruled off side and the ball is turned over to the defense. This is often overlooked if the attacker is well to the side of the pool or when the ball is at the other side of the pool. The key to the offense is to accurately pass (or "set") the ball into the center forward or hole set, positioned directly in front of the goal (the hole). Any field player may throw the hole set a ""wet pass."" A wet pass is one that hits the water just outside of the hole set's reach. The hole set attempts to take possession of the ball, to shoot at the goal, or to draw a foul from his defender A minor foul is called if his defender (called the "hole D") attempts to impede movement before the hole set has possession. The referee indicates the foul with one short whistle blow and points one hand to the spot of the foul and the other hand in the direction of the attack of the team to whom the free throw has been awarded. The hole set then has a "reasonable amount of time" (typically about three seconds) to re-commence play by making a free pass to one of the other players. The defensive team cannot hinder the hole set until the free throw has been taken, but the hole set cannot shoot a goal once the foul has been awarded until the ball has been played by at least one other player. If the hole set attempts a goal without the free throw, the goal is not counted and the defense takes possession of the ball, unless the shot is made outside the 5-meter line. As soon as the hole set has a free pass, the other attacking players attempt to swim or drive away from their defenders towards the goal. The players at the flat position will attempt to set a screen (also known as a pick) for the driver. If a driver gets free from a defender, the player calls for the pass from the hole set and attempts a shot at the goal. A classic 4-2 man-up situation. The attacking white team has 4 players positioned on 2 meters, and two players positioned on 4 meters. The five outfield defending blue players try to block shots and prevent a goal being scored for the 20 seconds of man-down play. In the top left corner, the shot clock can be seen, showing 28 seconds remaining in the white attack. If a defender interferes with a free throw, holds or sinks an attacker who is not in possession or splashes water into the face of an opponent, the defensive player is excluded from the game for twenty seconds (informally called a 'kicked out' or an ejection). The attacking team typically positions four players on the 2-meter line, and two players on 5-meter line (4-2), passing the ball around until an open player attempts a shot. Other formations include a 3-3 (two lines of three attackers each) or arc (attackers make an arc in front of the goal and one offensive player sits in the 'hole' or 'pit' in front of the goal). The five defending players try to pressure the attackers, block shots and prevent a goal being scored for the 20 seconds while they are a player down. The other defenders can only block the ball with one hand to help the goalie. The defensive player is allowed to return immediately if the offense scores, or if the defense recovers the ball before the 20 seconds expires. If a defender commits a foul within the five-meter area that prevents a likely goal, the attacking team is awarded a penalty throw or shot. An attacking player lines up on the five-meter line in front of the opposing goal. No other player may be in front of him or within 2 meters of his position. The defending goalkeeper must be between the goal posts. The referee signals with a whistle and by lowering his arm, and the player taking the penalty shot must immediately throw the ball with an uninterrupted motion toward the goal. Penalty shots are often successful, but the goalkeeper who blocks a "five meter" can expect a chorus of cheers from the stands. A shot is successful if the ball completely passes between the goal posts and underneath the crossbar. If a shot bounces off a goal post back into the field of play, the ball is rebounded by the players and the shot clock is reset. If the shot goes outside the goal and on to the deck (outside the field of play) then the ball is automatically recovered by the defense. If the goalie, however, is the last to touch the ball before it goes out of play behind the goal line, or if a defender purposely sends the ball out, then the offense receives the ball at the two meter line for a corner throw or "two meter" much like a corner kick in soccer or football. When the goalie blocks a shot, the defense may gain control of the ball, and make a long pass to a teammate who stayed on his offensive end of the pool when the rest of his team was defending. This is called cherry-picking or sea gulling. If the score is tied at the end of regulation play, two overtime periods of three minutes each are played. If the tie is not broken after two overtime periods, a penalty shootout will determine the winner. Five players and a goalkeeper are chosen by the coaches of each team. Players shoot from the 5-meter line alternately at either end of the pool in turn until all five have taken a shot. If the score is still tied, the same players shoot alternately until one team misses and the other scores. Overtime periods are common in tournament play due to the high level of skill of these superior teams; Team USA defeated Hungary in the 2004 Women's Water Polo World League Super Final when United States goalie Jackie Frank made two stops on penalty shots. Water Polo Defense: A defender may only hold, block or pull an opponent who is touching or holding the ball. On defense, the players work to regain possession of the ball and prevent a goal. The defense attempts to knock away or steal the ball from the offense or commit a foul in order to stop an offensive player from taking a goal shot. The defender attempts to stay between the attacker and the goal, a position known as inside water. If an offensive player, such as the hole set (center forward), has possession of the ball in front of the goal, the defensive player tries to steal the ball or keep the center from shooting or passing. If the defender cannot, he may intentionally commit a foul. The hole set then has a free throw but must pass the ball off to another offensive player, rather than making a shot at the goal. Defensive perimeter players may also intentionally cause a minor foul and then move toward the goal, away from their attacker, who must take a free throw. This technique, called sloughing, allows the defense an opportunity to double-team the hole set and possibly steal the inbound pass. The referee may refrain from declaring a foul, if in his judgment this would give the advantage to the offender's team. This is known as the Advantage Rule. Minor fouls (ordinary fouls) occur when a player impedes or otherwise prevents the free movement of an opponent who is not holding the ball, including swimming on the opponent’s shoulders, back or legs. The most common is when a player reaches over the shoulder of an opponent in order to knock the ball away while in the process hindering the opponent. Offensive players may be called for a foul by pushing off a defender to provide space for a pass or shot. The referee indicates the foul with one short whistle blow and points one hand to the spot of the foul and the other hand in the direction of the attacking team, who retain possession. The attacker must make a free pass without undue delay to another offensive player. If the foul has been committed outside the 5-meter line, the offensive player may also attempt a direct shot on goal, but the shot must be taken immediately and in one continuous motion. Because of this rule the hole set will often set up at or beyond the five meter mark hoping to get a foul, shoot, and score. If the offensive player fakes a shot and then shoots the ball, it is considered a turnover. If the same defender repetitively makes minor fouls, referees will exclude that player for 20 seconds. To avoid an ejection, the hole defender may foul twice, and then have a wing defender switch with him so that the defense can continue to foul the hole man without provoking an exclusion foul. The rule was altered to allow repeated fouls without exclusions, but is often still enforced by referees. Major fouls (exclusion fouls) are committed when the defensive player pulls the offensive player away from the ball before the offensive player has had a chance to take possession of the ball. This includes dunking (sinking in FINA rules), intentional splashing, pulling back, swimming on the other player's back, or otherwise preventing the offensive player from preserving his advantage. A referee signals a major foul by two short whistle bursts and indicates that the player must leave the field of play and move to the penalty area for 20 seconds. The referee will first point to the player who commits the foul and will blow the whistle, then they will point to the ejection corner and blow the whistle again. The player must move to the penalty area without impacting the natural game play. If the player does not leave the field of play, the player will be kicked out for the remaining time of the game with substitution. The remaining five defenders, to cover the six attackers on a man up situation, usually set up in a zone defense in front of their goal. The attacking team can expect to score, by adopting a 4-2 or 3-3 formation, and moving the goalkeeper out of position. A player that has been ejected three times must sit out the whole match with substitution, much like the six personal fouls in the National Basketball Association. A misconduct foul is an unsportsmanlike act. For unacceptable language, violent or persistent fouls, taking part in the game after being excluded or showing disrespect, a player is ejected for the remainder of the game with substitution after 20 seconds have elapsed. This type of foul is often called a roll because the referee signals the foul by rolling his hands around one another. If a player commits a violent foul with intention to harm, the player is ejected from the game without substitution. The opponents are awarded a penalty shot, and the ejected player's team plays one man down for the next four minutes of game time. This type of foul is called a brutality and is signaled by the referee by crossing the arms in the form of an X. A penalty shot is awarded when a major foul is committed inside the 5-meter line and the offensive player had an opportunity to score, or a goal was prevented by the foul. This usually means that the offensive player is in front of and facing the goal. The penalty shot is attempted from 5 meters. Any defenders flanking the player taking the shot must be no closer than 2 meters. The goalkeeper must be on the goal line. In high school rules, the goalie must keep their hips even with the goal line. They are allowed to lean their upper body over in order to kick up higher. The referee blows the whistle and the player must shoot immediately. Drawing the ejection (forcing defense to commit a major foul) occurs when an offensive player takes advantage of a defensive player by using body position and/or grabbing on their wrists to make it appear as though the defensive player is committing a "major foul," therefore resulting in the ejection of that player and gaining a 6 on 5 advantage. Another common way to draw an ejection is by staggering stroke while being chased to make it appear as though the defensive player is pulling the swimmer back. Even with good backup from the rest of the defenders, stopping attacks can prove very difficult if the goalkeeper remains in the middle of the goal. The most defensible position is along a semicircular line connecting the goalposts and extending out in the center. Depending on the ball carrier's location, the goalie is positioned along that semicircle roughly a meter out of the goal to reduce the attacker's shooting angle. The goalkeeper stops using his or her hands to tread water once the opponent enters the 7-meter mark and starts treading water much harder, elevating the body, arms ready for the block. Finally the goalie tries to block the ball down, which is often hard for the longer reaches, but prevents an offensive rebound and second shot. As is the case with other defensive players, a goalkeeper who aggressively fouls an attacker in position to score can be charged with a penalty shot for the other team. The goalkeeper can also be ejected for 20 seconds if a major foul is committed. When passing or shooting, the hips of the player should line up in the direction in which the ball is thrown with one hand. When passing, shooting or receiving a ball, the player rotates the whole of the upper body, using egg-beater to keep the lower body in the same position, then releasing the ball with hips lined up in the direction of the throw. For extra accuracy and speed when releasing the ball, a player uses body momentum to follow through at the end of the throw. There are two basic passes in water polo: the "dry" pass and the "wet" pass. When passing to a field position player, a dry pass (meaning the ball doesn't touch the water) is thrown a few inches above the head of the catching player and to the left or right side depending on the receiver's dominant hand. The dry pass allows for optimal speed when passing from player to player, who do not have to pick the ball up out of the water to throw. A fluid motion between catching and throwing is the goal. An expert thrower's hand creates backspin, making the ball easier to catch. In order for the player to catch the ball above their head, they must egg-beater harder which brings their body higher out of the water. The wet pass is a deliberate pass into the water. This is usually done when making a pass into the hole set. To make a successful wet pass, the ball lands just out of reach of the offensive player and defensive team. The hole set can then lunge towards the ball and out of the water to make a shot or pass. This is a very effective offensive strategy if a team has a strong hole set. The only thing the passer must look out for is a possible double-team on the hole set. If that happens the player must look for an open player or pass the ball closer to the hole set to avoid a turnover. Shots usually succeed when the goalie is out of position. At long range from the goal, shots are easy for goalkeepers to stop, but closer ones are very difficult. Close-range shots tend to be harder to come by (since players close to the goalpost are usually under very great pressure), but in these situations usually a soft tap-in is enough to beat the goalkeeper. Close-range shots may come from the center-forward in open play, utilizing either quick backhand-shots, sweep-shots, layout or other creative shooting positions. There are three basic outside water shooting techniques. The first is a straight forward power shot. Top-level water polo players can generate ball speeds between 50-90 km/h (30-56 mph). The player propels his body out of the water and uses his momentum to shoot the ball into the net. Though very powerful, this shot requires the precise targeting. If the shot is off the mark, the ball will either be blocked by the goalie or rebound off the goal post. Another shooting technique is the bounce shot or skip shot. Instead of shooting directly into the net, the player throws the ball at an angle directly into the water. If done properly and with enough force, the ball will bounce off the water and into the goal. The bounce shot usually takes the goalie by surprise. But, if done from far enough away the goalie can plan to block the ball low on the water instead of bringing the hands up in the air. The lob shot is high arching shot intended to pass over the goalie's hands and under the crossbar. It is most effective taken from an angle on either side of the goal post; this provides a large area behind the goalie into which the lob can drop on its downward arc. This shot confuses the goalie and usually forces the goalie to kick up out of the water too early and miss the block. Outside water shots require a player to cease swimming, and usually occur outside the 2-meter zone. A player who has inside water and has a defender approaching may not want to pause and let his defender catch up. In these situations, which can often result from driving after a foul has been committed on the hole set or during a close fast break counterattack, players may perform an inside water shot. The t-shot or bat shot is executed by scooping the ball with the non-dominant hand, "loading" the ball to the dominant hand, and propelling the ball forward. The pop shot is a quick shot executed by cupping the ball with the dominant hand from underneath the ball and releasing it, usually into a corner of the goal. This shot is timed with a player's swimming stroke, and should flow comfortably from the dribble. Other inside water shots include the screw shot, which can likewise be executed directly from the stroke, and a spring shot where the player pushes the ball slightly into the water (but avoiding a "ball under" foul) and then allows a sudden release. While beginning players will have difficulty integrating these shots into their stroke, resulting in weaker shots as compared to outside water shots, inside water shots by experienced players have sufficient force to skip past the goalkeeper. One thing the shooter must watch is how close they get to the goalie because they can come out of the goal and take the ball. Baulking (a kind of pump fake a.k.a. hezie or hesitation shot) is effective when using an outside water shot. The player gets in the position to shoot but stops halfway through. This puts the defense on edge and partially immobilizes the goalie by wasting his blocking lunge. This can be repeated until the player decides to release the ball. A good baulk takes a great amount of hand strength to palm the ball. Inner tube water polo is a style of water polo with the important difference that players, excluding the goalkeeper, are required to float in inner tubes. By floating in an inner tube players expend less energy than traditional water polo players, not having to tread water. This allows casual players to enjoy water polo without undertaking the intense conditioning required for conventional water polo. This sport is predominantly played at universities by intramural coed teams. The sport's rules resemble those of water polo, however, with no governing body the rules vary across different leagues. For example, while the winner is determined by the team which scores the most goals, some leagues award one point for a male goal, and two points for a female goal, while others award one for either. The game was invented in 1969 by now retired UC Davis associate athletic director of intramural sports and sport clubs, Gary Colberg. Noticing how much fun the water polo team was having, Mr. Colberg thought up the idea of using tubes so that people with no experience in water polo could still enjoy the game. Water polo balls: old (left) and new designs. Ball: A water polo ball is constructed of waterproof material to allow it to float on the water. The cover has a special texture so it won't slip from the hands of a player. The size of the ball is different for men's and women's games. Caps: A water polo cap is used to protect the players head and to identify them. Visiting team field players wear numbered white caps, and home team field players wear dark caps. Both starting goalkeepers wear quartered red caps, numbered "1," substitute goalies caps are numbered either "1-A" in NCAA play or "13" for FINA international play. Caps are fitted with ear protectors. Goals: Two goals are needed in order to play water polo. These can either be put on the side of the pool, or in the pool using floaters. Swimwear: Male water polo players often wear swim briefs. Some players prefer to wear two briefs for more security during play. Female players usually wear a one-piece swimsuit. During the later parts of the nineteenth century, (May 12, 1870) the London Swimming Association developed a set of rules for indoor water polo. The creation of water polo has been credited to William Wilson, who at the time called it football in water. However, his development of the game was quite marginal and there are no records indicating that he played any role in the evolution of the game. In ‘’1869’’ Water polo comes to the surface in England, with the rules varying from region to region. A goal was scored by a player carrying the ball with two hands into a boat. One or two goalkeepers standing on the boat were jumping on the opponent in order to prevent the goal. 1870 - London Swimming Association set down 11 rules for the so-called water football. Duration of the game was 20 minutes. Ball may be passed or carried from a player to another either on or below the surface of the goal. No player was allowed to interfere an opponent not holding the ball, otherwise a free throw is awarded to the opponent at the place that the foul occurred. 1876 - The Scot WILLIAM WILSON set of rules is published. 1879 – This year marked the advent of goal posts similar to those of football. The dimensions of the field of play were not yet uniform. The number of players was approximately nine. 1885 - After improving gradually year by year, the game of water polo was finally accepted by the National Swimming Association of England in 1885. 1890 - This year marked the first international game held, featuring England and Scotland. England would win this game by a score of 4-0. 1904 - At the Olympic games of Saint Luis, the European teams did not participate since the Americans wanted to apply their own rules, foreshadowing international conflicts during later years. 1905 - The international splashing and hitting the ball with clenched fist were considered as willful fouls. 1908 - FINA is established and adopts the set of rules that were existing by 1900 with minor alterations. The ball had to be made of leather with the inside made from rubber. 1918 - The player nearest the occurrence of a foul should execute the free throw. 1919 - It was described the manner in which a free throw should be excluded. 1926 - LEN is being established. 1928 - The system of measuring the dimensions of the field of play by yards was resumed. A free throw awarded to the goalie could be executed by any player closest to him. Disobedience was considered a foul. The depth of the pool had to be at list 1.40 meters. 1929 - International Water Polo Board (IWPB) is appointed by FINA in order to elaborate new rules. 1932 - Fouls were subdivided into well defined categories under the headings of “ORDINARY FOULS,” “MAJOR FOULS AND PENALTIES.” Dimension of the field were set on 30 meters of length to 20 meters wide. The ball should weight between 400 and 450 grams. 1936 – James R. Smith proposed the substitution of the leather ball with synthetic rubber ball. In America the new ball is quickly accepted, while in Europe appears after 1956. 1938 - Splashing inside the 4 meters area became a major foul resulting to an exclusion from the game and a penalty throw. 1942 - Throwing directly at goal from a free throw for major fouls outside the 4 meters area was allowed. 1949 - The International Water Polo Board after the Olympic games of London proposed the testing of the South American rules that were giving the possibility to the players to move after the whistling of the referee. The effect was immediate, changing drastically the character of the game. The possibility to throw directly from a free throw for major fouls outside the 4 meters area was abolished. 1950 - That is the end of the standing era of the game. Test year for a new set of rules like:_ The rule that prohibited the moving of the players after the blowing of the referee whistle was cancelled officially. The duration of the game became two periods of 10 minutes instead of 7 minutes A goal could be scored if the ball has been played by at list 2 players. The goalkeeper was restricted to execute a free throw awarded to himself, not being able to let the closet player to do it for himself. 1952 - Every decision of the referee becomes definitive. 1956 - The restarting at half field after a goal was introduced. Committing any foul within the 4 meter area, except a foul on a play from which a goal could probably be resulted, was considered as a major foul. Players committing a 4-meter penalty were not excluded of the game. The exact definition of the underlay was established. 1961 - Duration of the game became four periods of 5 minutes each. The teams should be composed by seven players and four substitutes that could enter the game at determinate moments. 1964 - In that year in Toldo FINA instructed to the IWPB to pick up out of the best suggestions of those presented by the member countries. 1967 - With the idea to keep during the game equal number of players on both sides is introduced the penalty point system. According to that rule every major foul caused a penalty point. At the third penalty point accumulated by any team, a penalty throw was awarded against the offending team. 1969 - Trial year for new changes of the rules around the world. To promote understanding of the rules FINA creates illustrations for the most frequently occurring fouls. 1970 - Instead of the penalty point system is introduced the three personal major fouls (Exclusions) was excluded definitely from the game and only one (1) minute after another player could take his place. 1971 - Exclusion of a player committing a major foul for one (1) minute is introduced. Every foul committed on dead time was considered as a major foul. Possession of the ball for the attack was restricted to 45 seconds. Replacements were possible after scoring a probable goal caused a 4-meter penalty throw. An excluded player should re-enter within 2 meter from the corner of the field of play on the side of goal judges. Behind the line of the ball there was no offside not even into 2 meters area. 1977 - Possession of the ball is reduced to 35 seconds. Exclusion time is reduced to 45 seconds. The two referees system was introduced. Goalkeepers can throw the ball up to the opponent's 4-meter line Any player can take the free throw given to his team, but without any delay and from the place that the free throw has been awarded. The assigned free throw due to an exclusion fault, could be executed as soon as the excluder player started to leave the playing field. (Until that time the game had to stop waiting the excluded player to leave the field of play). Regarding fouls committed in dead time was specified that if such a foul has been committed by an attacker, a free throw should be awarded to the opponent and a personal fault (to be recorded) against the player committing the offensive foul. Regarding such a foul committed by a defender, an exclusion 45 seconds should be awarded (or until a goal has been scored). When the ball was out of the field of play are serve ball should immediately thrown in. Cups with ear protector were introduced. 1981- A unified code of signals for the referees has been introduced. The number of players has been raised to 13 (6 substitutes). Duration of the game becomes four periods of 7 minutes. Goalkeepers can throw off the ball at any point within the 2-meter area and not only from the goal line between the goal post. At the beginning of the game the clock starts at the moment that one of the two players swimming for the ball, is touching the ball. Putting the ball underwater in order to prevent a goal cause a 4-meter penalty. 1984 - FINA Congress at Los Angeles. The TWPC presented two revolutionary rules: To reduce the exclusion effect by the immediate substitution of the excluded player from a substitute player at the corner of the field. The target of that proposition was to decrease the importer nee of the man up situation and urge the players to act more rapidly. To prohibit to a player having his back toward the opponent goal post nd already have received a free throw to remain at his place. Both proposals were not accepted. 1986 - FINA Technical Congress in Madrid. The following changes were approved. The exclusion time reduced to 35 seconds and the excluded player can re-entry on the signal of the referee if his team recovers the ball. Committing ordinary fouls in a raw is not any more a major foul. Committing an offensive foul should not be any more considered as personal fault. The exclusion time is reduced to 20 sec. and the excluded player can re-enter on the signal of the referee if his team recover the ball. The goalkeeper can score. At the end of 35 sec. of possession or at the end of a period of playing if the ball is on the way to the goalpost and enters, the goal is valid. 1992 - FINA on December 1992 decides the organization of the 1st World Water Polo Seminar. Wished to:_ Create a balance between the countries by allowing more pools to meet the requirements for Water Polo: Make the game more spectacular and better product for T. V. Speed up the game and increase the number of counterattacks. Create more action in front of the goal. and proposed: The experimentation of eight revolutionary rules like:_ 1- Reduction of the size of the field to 25 x 16 meters. 2- Reduction of the number of players on six instead seven 3- The use of smaller ball. 4- Immediate re-entry of the excluded player. 5- Substitution of a player could be done at any time 6- Immediate shot out of 7 meters after a free throw. 7 - Refereeing should be do be without flags. 8- Coaches of teams in possession of the ball may request 2 time outs of one (1) Minute per game. 1994 - At the FINA Technical Congress in Rome, August 19994. It was decided to experiment the new rules during the Junior World Championships at Dunkirk 1995. The Congress rejected the first four basic revolutionary rules and were approved the second four (5-8) to be enforced after the Olympic Games in Atlanta. Women's water polo owes much of its early development to the Netherlands. In 1906, the first women's game was played in Harlem, Holland. This, however, was a very much condensed version of women's water polo. In fact, following the Los Angeles Athletic Club's victory at the 1926 Nationals, the sport was considered too brutal and barbaric for women. Thirty fives years later, the sport was resurrected by Rose Mary Dawson, coach of the Ann Arbor (Mich.) Swim Club. Led by goalie Micki King, Dawson's teams captured the rejuvenated Nationals in 1961-1963. King would later seek international fame as an Olympic gold medalist in diving. The first FINA World Cup for women was organized in 1979. The United State team won the goal medal. In 1986, women's water polo gained full status as an official World Championships sport. Although women's water polo has not yet gained Olympic status, women compete at the international levels (except at the Pan American Games). Women's water polo is represented on five continents and in 40 countries, meeting IOC requirements (35 countries for three continents) for a "new event" as an Olympic sport. The aquatics community is hopeful that women's participation will be included at the 2000 Games. The sport itself, while not considered NCAA level, is extremely popular at the college level. Men's water polo at the Olympics was the first team sport introduced at the 1900 games (along with cricket, rugby, football (soccer), polo (with horses), rowing and tug of war). Women's water polo became an Olympic sport at the 2000 Sydney Olympic Games after political protests from the Australian women's team. Every two to four years since 1973, a men's Water Polo World Championship is organized within the FINA World Aquatics Championships. Women's water polo was added in 1986. A second tournament series, the FINA Water Polo World Cup, has been held every other year since 1979. In 2002, FINA organized the sport's first international league, the FINA Water Polo World League. ↑ FINA Water Polo Rules 2005-2009 - Retrieved October 29, 2007. ↑ "The Technique of the Eggbeater Kick" in Coaches Infoservice. Coaches Info. Retrieved February 5, 2009. ↑ Dr. Richard Hunkler, national water polo coach of the year in 1993 and 1994, has compared this aspect of the game to chess. See: Richard Hunkler PhD, Water Polo Planet (April 1, 2006): Water Polo Is the Chess of Sports, Waterpoloplante.com. Retrieved February 5, 2009. ↑ See WP 20.17 for time of possession, Fédération Internationale de Natation. Retrieved February 5, 2009. ↑ FINA Water polo pool diagram, Fédération Internationale de Natation. Retrieved February 5, 2009. ↑ 'hole' or 'pit', eHow Inc. Retrieved February 5, 2009. ↑ FINA Water Polo rules: WP 20.5 (Goalkeeper may touch pool bottom), Fédération Internationale de Natation . Retrieved February 5, 2009. ↑ US Olympic Team News: 2004 Women's Water Polo World League Super Final. USOC. Retrieved February 5, 2009. ↑ FINA Water Polo Rules, Section WP 7.3: Advantage Rule, Fédération Internationale de Natation. Retrieved February 5, 2009. ↑ Intramural Inner Tube Water Polo at Colleges, imprint magazine. Retrieved February 5, 2009. ↑ International Olympic Committee Water Polo Site, IOC. Retrieved February 5, 2009. How it all Began, Athleticscholarships.net. Retrieved February 5, 2009. History and Development: A close look, Power Water Polo. Retrieved February 5, 2009. Hale (ed. ), Ralph (May 1986). The Complete Book of Water Polo: The U.S. Olympic Water Polo Team's Manual for Conditioning, Strategy, Tactics and Rules. Fireside, 160 pages. ISBN 0671555634. Jones, Bryan (December 2004). SportSpectator Water Polo Guide (Basic Water polo Rules and Strategies). DLH Publishing, 8 pages. ISBN 1879773074. Norris (ed. ), Jim (April 1990). The World Encyclopedia of Water Polo by James Roy Smith. Olive Press, 513 pages. ISBN 0933380054. Wiltens, Jim (August 1978). Individual Tactics in Water Polo. X-S Books, 87 pages. ISBN 0498020029. All links retrieved August 11, 2013. This page was last modified on 11 August 2013, at 21:01.